White Pikmin (白ピクミン?) are a type of Pikmin found in Pikmin 2 and Pikmin 3. They are the third type of Pikmin found in Pikmin 2, and are produced through Ivory Candypop Buds, the first of which are found in the White Flower Garden. They are not present in Pikmin, and they are only found in the Mission and Bingo Battle modes of Pikmin 3. They are distinguished by their red eyes, white color, small stature, and most of all, their relation to poison. Like Purple Pikmin, their flowers are magenta rather than white. In Pikmin 3, they are also obtained from Ivory Candypop Buds, but can sometimes be found planted in the ground, in some stages. In this installment, their poison invulnerability is not used, and their strengths and weaknesses have been rebalanced. A Dwarf Red Bulborb dying by consuming the poisonous White Pikmin. These Pikmin are smaller than other types of Pikmin. They have red eyes that allow them to locate treasures that are completely buried underground, which is demonstrated shortly after discovering them in the White Flower Garden. They are the fastest of all Pikmin, such that, when flowered, they run at least as quickly as leaders equipped with Rush Boots. In Pikmin 3, this is their main ability, as they are only found in Mission Mode, which requires carrying back treasures quickly. In Pikmin 3, they have weaker attack power than most other Pikmin, on par with Winged Pikmin, but match the strength of the standard types in Pikmin 2. 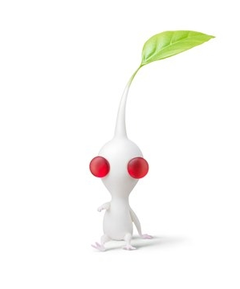 White Pikmin also possess the unique ability to be able to stand through poisonous gases without choking to death, as do Bulbmin. This makes them quite important when taking out poisonous enemies and destroying gas pipes, although other types of Pikmin might still be able to cause damage, with some difficulty. Upon being eaten, White Pikmin eject a poisonous fluid into the eater, which poisons them. This causes instant damage, and is often enough to kill smaller enemies, like a Dwarf Orange Bulborb. With that said, this does not prevent the Pikmin's death, so it should be used as a last resort. The damage dealt by poison is considerably weaker in Pikmin 3. For example, one White Pikmin is enough to kill one Red Bulborb in Pikmin 2, but 3-4 must be used to kill the same creature in Pikmin 3. In Pikmin 3, they seem to not be immune to ink or the Vehemoth Phosbat's dust, which are the two closest things to poison in the game. A White Pikmin when first discovered in the White Flower Garden. Captain Olimar first finds the White Pikmin in the White Flower Garden. On the 3rd sublevel, he runs across 3 Ivory Candypop Buds, and throws his available Pikmin into them to turn them into White Pikmin. Once he plucks one, the Hocotate ship immediately notices that they are much smaller than the others, but appear to be faster. On their way through the sublevel's exit route, the White Pikmin stop in their tracks and automatically start digging out a buried treasure in the way, alerting Olimar and Louie of their ability. White Pikmin are never officially discovered in Pikmin 3, but, as mentioned, do appear in certain Mission Mode and Bingo Battle stages. The most notable stage with White Pikmin in Mission Mode is Tropical Forest Remix, where it's possible to get up to sixty two White Pikmin thanks to the Ivory Candypop Buds. White Pikmin are needed for the following treasures and tasks, as no other Pikmin type is up for the job, not even if exploits are used. Any and all fully buried treasures. Such a list can be found here. Gas pipes are hazardous obstacles that often block treasures and can only be destroyed by White Pikmin. White Pikmin are recommended for the following tasks, although they are not strictly necessary. Geographic Projection: There is a gate covered in gas pipes blocking the way to the treasure. However, it's possible to ignore the gate and build the bridge by the treasure instead by going out of bounds, or by using Blue Pikmin (the early Blue Pikmin glitch is required for this latter method). Seed of Greed: The section of the Wistful Wild with this treasure is blocked off by two gates with gas pipes, each on different exits. The pipes can be destroyed with the Gatling Groink's shots, though. Anti-hiccup Fungus: Same as Seed of Greed. Subterranean Complex: The entrance is locked by a poison gate, although it is possible to get a leader onto the ledge by using a carrying path oversight. Other Pikmin types can also take down the gas pipes on certain throws. Snagret Hole: To reach the section of the map with the entrance to the Snagret Hole, a bridge must be built that has gas pipes around them. However, it is possible to use a carrying path oversight to get a leader to the top of the ledge where the Sunseed Berry is, from the landing site. Dream Den: Same as the Seed of Greed. The Yellow Onion is in a room closed off by a gate with gas pipes. It is, however, possible to use a carrying path oversight to get to that room and bypass the gate. In addition, other Pikmin types can also, if ineffectively, destroy the gas pipes. A White Pikmin spewing some form of acid in Occupational Hazards. White Pikmin are poisonous; if ingested by an enemy, they will poison their foe (with different enemies requiring different doses before dying). However, it is possible that White Pikmin may be venomous as well. Venom must be injected with a wound from the attacker, and although White Pikmin do not do that directly in any canon game, some hints in non-canon media indicate that they might be able to expel some hazardous material and use it similarly to venomous creatures. On Occupational Hazards, a White Pikmin spews some form of acid at one point. The contents of the liquid are not known, but the fact that the Pikmin can expel it might mean that it is possible for White Pikmin to attack enemies by injecting this liquid, making them partially venomous. 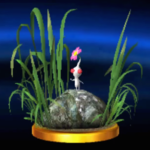 In the Super Smash Bros. games, when a White Pikmin pummels an enemy (either via Olimar's grab or side special attack), some "poison" particles are emitted and extra damage is caused, compared to a normal Pikmin strike. Once again, this could be an ability White Pikmin have to stab venom into their prey while attacking. Although those points are ambiguous at best, the European version of their trophy in Super Smash Bros. for Nintendo 3DS and Wii U does mention that they have venom. 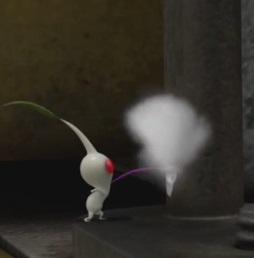 Even though this information only applies to non-canon media, White Pikmin do emit a cloud of "poison" from their mouth area on their introduction cutscene. This could be a sign of a potential venom injection ability that goes unused by the Pikmin in the canon games. White Pikmin, like Purple Pikmin, are only present in Mission Mode and Bingo Battle, in Pikmin 3, and even then, only in some of the levels. This list contains all stages where White Pikmin can be found, either ready to use, or obtainable through Ivory Candypop Buds. Shaded Garden – Collect Treasure! White Pikmin appear in Super Smash Bros. Brawl, Super Smash Bros. for Nintendo 3DS and Wii U, and Super Smash Bros. Ultimate as a kind of Pikmin that Olimar is able to pull from the ground via his standard special move, Pikmin Pluck. They also appear as a trophy in Super Smash Bros. Brawl and Super Smash Bros. for Nintendo 3DS and Wii U. They have the lowest vitality, and deliver the lowest amount of damage and knockback if Olimar uses them for his aerials and smashes, but when they latch onto an enemy, they deal poison damage, which is much more damaging than the pummeling of other Pikmin. White Pikmin can be thrown the farthest, despite this not being the case in the Pikmin games. In Brawl, they also appear as a sticker. “A type of Pikmin. White Pikmin are resistant to poisons and are themselves toxic to creatures that eat them. Their low weight makes them very speedy, and they can also dig up buried items. White and purple Pikmin do not live inside Onions, so you must change other Pikmin into them by tossing them into ivory candypop buds and violet candypop buds. “These tiny, white Pikmin have bright-red eyes. They are the fastest of the Pikmin, perfect for finding and retrieving hidden treasure. In Smash Bros., you can use them to poison your enemies. Since they can fly the farthest of any Pikmin when thrown, use them to poison enemies from afar. “These small, fast-footed Pikmin are white with red eyes. That ominous look they have might give you the chills, and you'd be right to be scared – the little blighters are poisonous! In this game, they'll hang on to any enemy you throw them at and generously share their venom with them. White Pikmin digging up buried treasure. Louie, about to throw a White Pikmin. The different maturity stages of a White Pikmin in Pikmin 2. Clay artwork of a fully matured White Pikmin. Clay art of a fully-flowered White Pikmin. A White Pikmin and a Purple Pikmin carrying the Time Capsule. White Pikmin's abilities explained in the manual of Pikmin 2, Pikmin 3 and New Play Control! Pikmin 2. A White Pikmin on the expanded version of the Pikmin 3 box art. The three stages of the White Pikmin: leaf, bud, and flower. 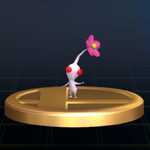 A White Pikmin in Super Smash Bros. Brawl. White Pikmin as seen in Super Smash Bros. for Nintendo 3DS. The White Pikmin trophy in Super Smash Bros. Brawl. A White Pikmin sticker from Super Smash Bros. Brawl. A plushie of a White Pikmin. The White Pikmin carrying the Massage Girdle is larger than the one standing behind Olimar. While carrying an object, White Pikmin will become slightly larger, about as large as any other Pikmin type. They revert to their original size once they stop carrying said object. This will occur in both Pikmin 2 and New Play Control! Pikmin 2. White Pikmin have a subtle shift from white to a purplish tint at the end of their limbs. This trait of color-shifting is uncommon in most Pikmin types, although it is much more noticeable in Winged Pikmin. Another similarity to Winged Pikmin is that White Pikmin have smaller leafs, buds, and flowers. This page was last edited on March 17, 2019, at 11:31.